British triple jumper Phillips Idowu has been voted men's European Athlete of the Year after his victory in August's World Championships. The 30-year-old, who beat Portuguese rival Nelson Evora by 18cm to clinch gold in Berlin, will be presented with his award in Budapest on 17 October. Idowu is the first Briton to win the award since Dwain Chambers in 2002. Spain's distance runner Marta Dominguez received the female award in a poll of experts, fans, media and federations. The accolade caps a season in which Idowu has finally begun to fulfil his true potential on the global stage. At this year's World Athletics Championships the East Londoner shrugged off memories of a disappointing silver in Beijing to take the title with a world-leading and personal best jump of 17.73m. 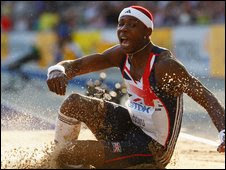 Previous British winners include Colin Jackson, Linford Christie and Jonathan Edwards, one of Idowu's predecessors as triple jump world champion. Norwegian javelin thrower Andreas Thorkildsen came second in the men's vote, with high jumper Yaroslav Rybakov of Russia in third place. Croatia high jumper Blanka Vlasic finished second in the women's award, just ahead of pole vault phenomenon Yelena Isinbayeva.